Grooming your beard correctly takes patience and time. There are many beard products out there that can really help you to develop that thick, healthy, and manly beard. Here are top 5 most used beard care products that will help with your grooming process as you grow and maintain your beard. 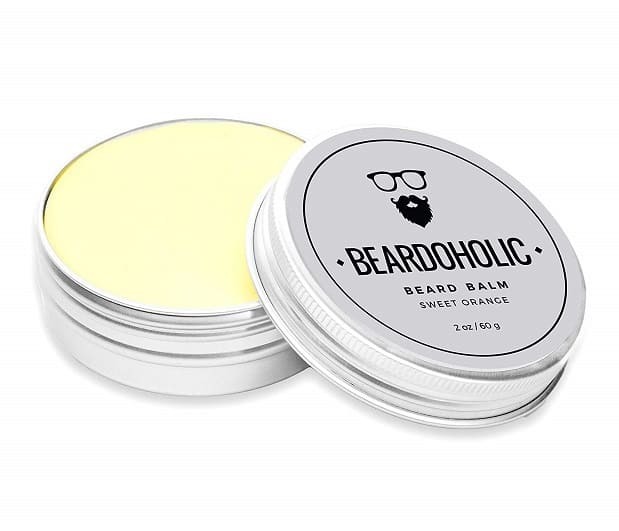 Of all the beard grooming supplies that you need to maintain a quality looking and feeling beard, the beard balm could have the biggest positive impact. The beard balm helps to provide the facial hair the nourishment it needs to grow healthy while reducing the discomfort that can be associated with the early stages of facial hair development. Applying the beard balm will help keep the hair soft while working to reduce that itchy discomfort that can affect the skin under the beard. The key is getting the balm over every strand of hair in order to enjoy the maximum results. Similar to a leave-in moisturizer for your hair, the beard balm will remain working long after you apply it. The beard balm also has exceptional hydration properties too. Keeping the hair hydrated is important for growth and for ensuring the overall appearance of the beard is striking. One of the most important factors concerning the beard balm is the protecting qualities. The balm can not only help ensure moisture stays trapped in the hairs, it can also protect from damage against the wind and the dangerous rays of the sun. High-quality organic beard balm with Shea butter or beeswax also give that extra oomph to your beard, especially if the facial hair is thick, coarse, or long. The beard balm works effectively to tame flyaway hair, especially in between trims. You will certainly notice that your beard not only feels softer, but it will also have a noticeable healthy shine too. For those guys with especially wild and long beards, the beard balm does double duty as a type of styling gel. The best time to apply the beard balm is after you shower, or anytime that the facial hair is damp. Simply rub some of the beard balms between your fingers and apply generously over the entire beard. When it comes to using a beard comb, you have to realize this is not the same as combing the hair on your head. There are rounded, short, long, and pick beard combs, all designed to help guys with specific type facial hair. Then you need to consider the material of the beard comb and whether it has wide or fine teeth. To make this easier for guys, the first thing you should consider is the teeth in the beard comb. Most beard combs are manufactured in metal, plastic, wood, or even bone, and the price jumps considerably as you go from plastic to bone. The better quality the material of the comb is designed for longer beards that are difficult to manage. Smaller plastic combs work perfectly on those beards with shorter fine hair. 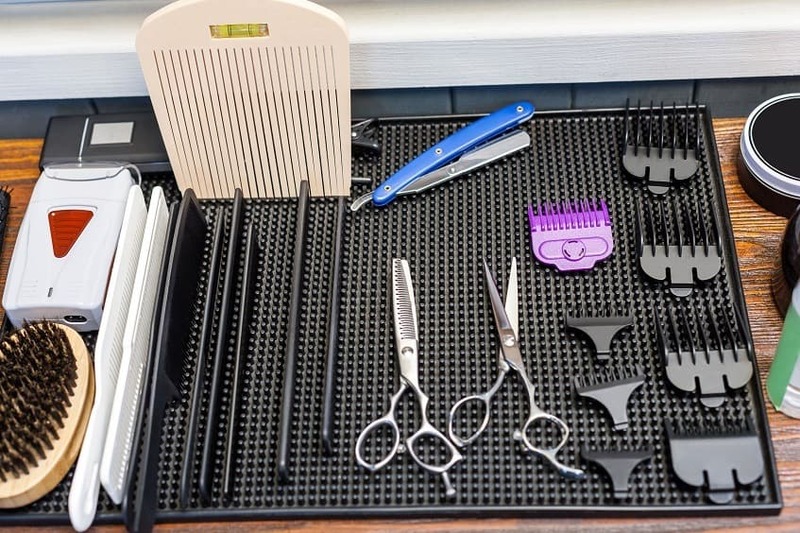 Regardless which type beard comb you choose, it is important to understand that this grooming device does so much more than simply style your beard. Another great tool to help you with styling your beard is beard shaper. 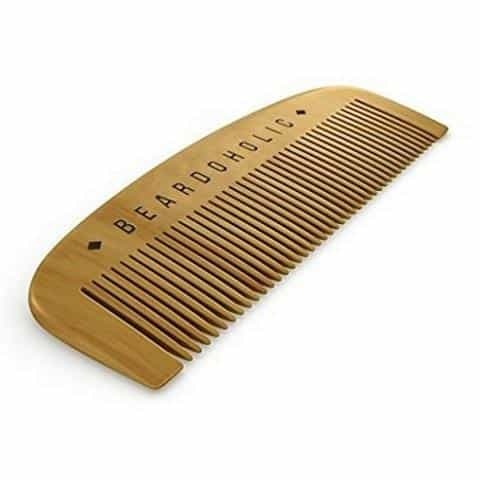 The beard comb first reduces tangles and knots that can easily develop in the facial hair. The comb is utilized to distribute beard oils and balm into all the hairs on your face. The comb helps to ensure you do not miss any areas of the beard that you would if you were only using your fingers to spread the oils. The comb distributes your product and it tames the hairs to cooperate and grow in a particular manner as well. The wide teeth combs allow the hair to be spread apart so certain grooming products can get deep down to the roots and the skin on the face more easily. Consider getting a beard comb combo package that comes complete with some essential oils and balms. The comb not only grooms the beard, but it also helps to remove any beardruff or dead skin that might be accumulating deep in the beard. It is important to choose the right width teeth on the comb for your beard. If you choose just any beard comb, it can pull out the hair at the roots and lead to serious skin discomfort and irritation. What does beard oil do? The beard oil is an essential grooming product that helps to support and grow all different types of facial hair. This product is usually developed with essential oil that can be produced with a variety of fragrances. The reason it is so important to go with organic beard oils is that the facial hair is far more coarse than the hair on your head. The facial hair benefits greatly from pure ingredients that will allow you to groom and keep up the look you prefer. The beard oil will allow you to pull off that well-groomed and shaped look that is visually appealing while enjoying a more comfortable feeling beard. Beard oil is also known as a beard conditioner and for a very good reason. The beard oil serves double duty as it moisturizes the facial hair and soothes the skin beneath. As the oil is evenly distributed with your beard comb, it works its way down the hair shaft to the follicles, and then on to the skin below where it helps to reduce itching. Most of the men develop what is called beardruff, a form of dandruff and the beard oil combats the symptoms associated with those itchy little flakes. Incorporating the beard oil into your nightly routine will significantly reduce the appearance of those embarrassing while flakes in the beard. 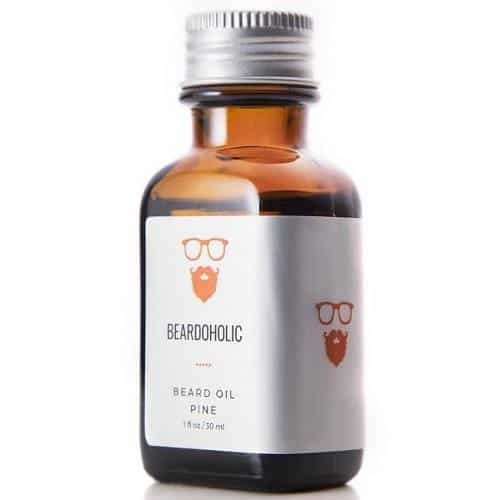 For guys who are trying to grow and establish their manly beards, the beard oil is essential for cutting down on the itching and irritation that usually occurs within the first few months of growth. The oil helps to set the optimal conditions for growing a healthy looking beard, preventing breakage, and split ends as the hairs grow. The beard oil is an important tool in your efforts to grow a healthy looking beard because it works to keep the hairs growing uniform and prevents those stragglers that can really disrupt the appearance of your facial hair. One of the things to consider with a beard oil is the fragrance. The majority of the beard oils do come with fragrances, and it is advisable you choose one that has a scent you enjoy because unlike the hair on your head, the facial hair is directly under your nose and you will occasionally be smelling that oil. Choose an organic oil with a fragrance you enjoy and your beard will look and smell amazing. Or you can simply go for the unscented beard oil like Ranger Grooming Co. and combine it with your favorite cologne. One of the most popular trends, when it pertains to men’s grooming, is the beard shampoo. These products are specifically designed to treat coarse beard hairs and the skin below. The beard shampoo is developed differently than the shampoo that you would use on your head, and for good reason. The skin under your beard is much more sensitive than the scalp, and organic ingredients that work to soothe and not irritate the skin can help to provide relief from discomfort and help the hairs to grow more healthy. Under the beard, the facial hair is trying to sprout through thick skin and other hair shafts. 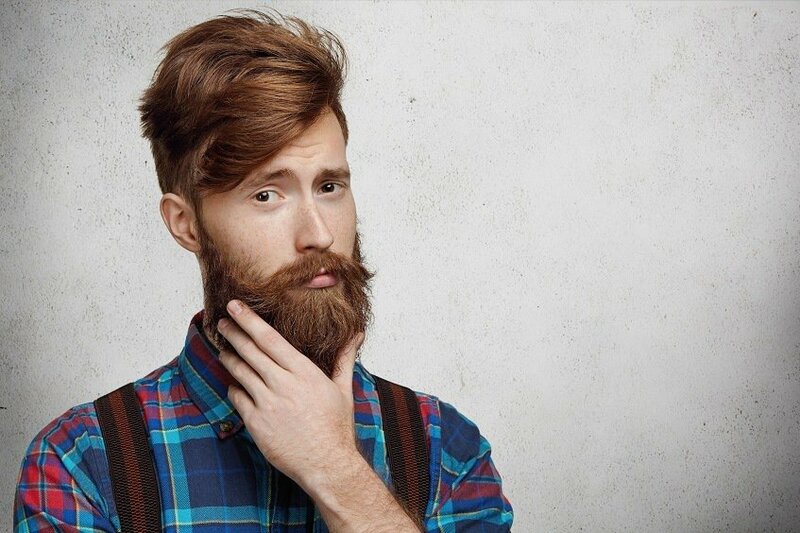 If the hair is too coarse, this growing process can be extremely uncomfortable for the majority of men, and the main reason most guys wind up shaving off the beard within the first two months. The beard shampoo will cleanse the facial hair thoroughly and help to remove flakes, dirt, and contaminants trapped deep below the facial hairs. The result is a smoother and softer beard, helping to reduce those unsightly dandruff flakes that can easily accumulate in the beard. 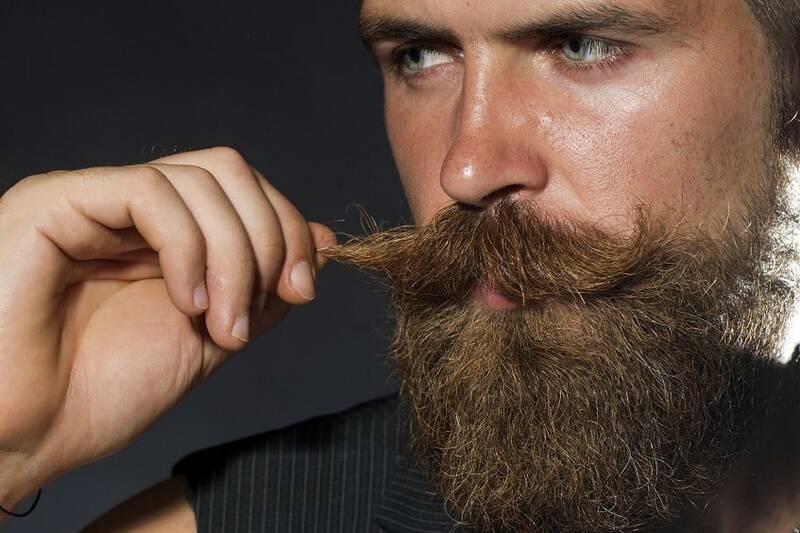 Although the beard shampoos might appear costly, you only need a very small amount to properly cleanse the facial hair. Those with a long and thick beard especially will benefit greatly from a high-quality beard shampoo. Regular shampoo strips away the natural oils in the facial hair, leaving it brittle and susceptible to breakage. Beard shampoo helps to moisturize those coarse longer hairs and reduce the likelihood of flakes developing. Utilizing a beard shampoo every time that you shower will help to transform even the wildest beards. The shampoo makes it easier to run a styling comb through and will help when you apply your beard balm for styling. 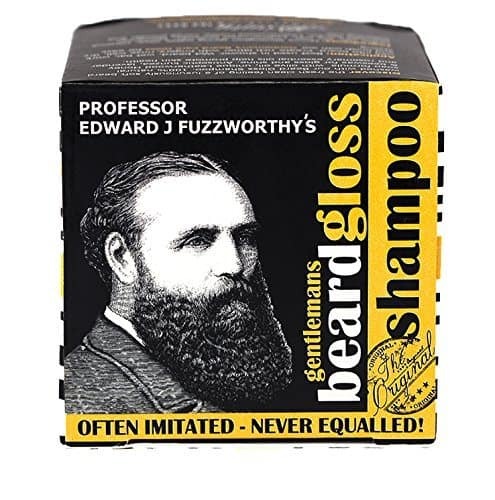 The beard shampoo will reduce the appearance of a flaky red face that can result from using hair shampoo on your face. The beard shampoo will help those guys just starting out growing their beards by allowing them to get through this rough stage more easily. The beard shampoo will soften the hair while removing any dead skin cells that are left on the surface of the face. The importance of using a beard soap can’t be understated. The beard soap is specifically designed to treat facial hair and the skin on your face. 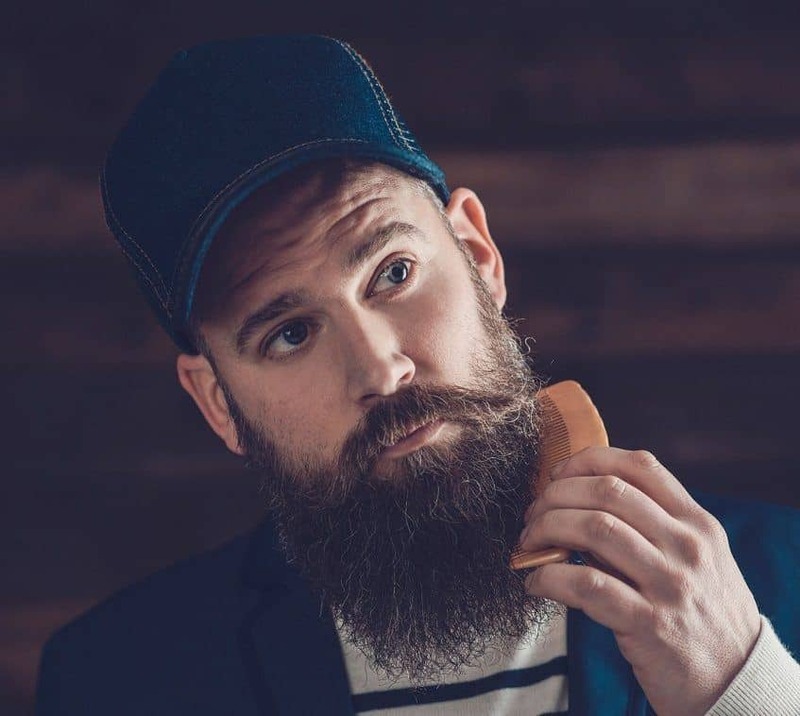 Although the beard soap primarily cleanses the hair follicles of debris, there are many other benefits that help to make grooming your beard much easier. The cleansing capabilities of the beard soap are extremely important and should be your top consideration for buying this product. The longer the facial hair, the more allergens, debris, food particles, and dirt, can become trapped deep below the surface. 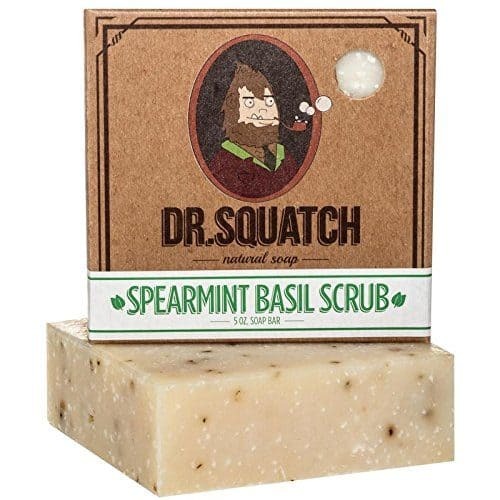 The exfoliate ingredient in the beard soap lathers well and will easily remove any grime or dirt that has accumulated in the beard during the day. The beard soap helps with manageability and keeps both the hair and skin moisturized, allowing your facial hair to look healthier. Frequent showers and beard shampoos strip away many of the natural oils in the hair, so a quality beard soap can help to cleanse without stripping away those oils. The best organic beard soap will leave your beard very manageable after drying, free of any tangles and with some added volume. The soap will allow you to comb the hair more easily without risk of breakage. With a good quality beard soap, you will be able to muster up a really nice lather, and that later will be able to penetrate deep into the beard and reach the delicate skin below. Like the beard oils, balms, and shampoo, the beard soap does come with fragrances that can often time overwhelm you due to the proximity of the nose. Choose a beard soap with either no fragrance or one that is mild enough that you only get gentle hints of it. When choosing your beard soap, it is important to remember that the larger the bar, the more bang you are going to get for your buck. Remember the skin under your beard is especially vulnerable to harsh ingredients, so try to go all-natural and find one that fits your budget, so you will give your face and hairs a chance to get accustomed to the ingredients. Utilizing one or more of the best beard care products will help you to grow a thicker, healthier, longer, stronger, and cleaner beard. Getting past those dreaded first few months is much easier with the help of these grooming products. Keeping your beard well maintained is a breeze when you start to implement a few of these products into your daily grooming routine. Photos from: Сергей Тряпицын © 123RF.com, Gleb TV © 123RF.com, Ysbrand Cosijn © 123RF.com, avemario © 123RF.com, Sergei Aleshin © 123RF.com and hootie2710 © 123RF.com. Finely all-in-one article about which product is for what. Great! Now I know that I need to buy beard comb to use it with my beard oil. I knew I was doing something wrong. Really comprehensive article. Thumbs up for a infographic. My wife would never forgive me if I quit using my Backwoods beard balm and birch tar soap! Great article. Thank you. Ok, now i have an answer. Thnks!!! I have had a beard of some sort for over a decade on and off. I usually cut it all off once it became puffy or unruly as my beard is crazy thick. After visiting an upscale BARBER, not hair salon or quick cut place, I learned a lot and now get most of these products and have a true beard going. I need to get the soap too though….. I have a very long beard, I always use beard oil but have never thought of using balm, should I be using it? and how do you apply it on a long beard such as mine? Timothy, oils, and balms are similar, but oil doesn’t offer the same hold as a balm because there isn’t a wax in it. So try using beard balm, and see how you like it. But you don’t have to give up on beard oil to start using a balm, use both at the same time. And if you do, apply the oil before the balm. Start with a dime-sized amount of balm (because it will go a long way) and work it into your beard starting at your neck, then upwards toward your chin, sideburns and work your way down. If some parts of your beard are still dry scrape up some more balm. You should massage it into your skin too. And that’s it. Finally started using some of the products, on advice of a friend. It’s making a huge difference in the texture, manageability and overall feel of the beard area. If I’d only known this about 20 years ago, who’d have known where I would have been by now. and healthier with my new found knowledge. Use oils and gels If you have got beard care products at home, you can pat your back for it was a smart move. But if you have grown a long beard and still don’t use beard care products, you must consider trying them sooner. Use beard care products from a reliable brand and use them every day to keep your beard in good shape. Nice article! I am using all of these and I have changed all my beard grooming products to use those from ”Groom industries” and I really like those! One doesn’t go without the other! I wouldn’t live without my beard balm + comb + beard oil AND beard shampoo. Fabulous and well detailed post. I can’t stress enough how important beard care products are. Good to see men taking care of themselves and their beard.